➦In 1902...actor House Jameson was born in Austin, Texas. Success on Broadway led to a starring role in CBS radio’s Renfrew of the Mounted, and the part for which he is beloved, playing father over the 14 year run of NBC’s The Aldrich Family. When the family comedy went to TV in 1949 he was the only radio cast member to move with it. His many guest appearances on TV through the 1960’s were highlighted by recurring roles on the soaps The Edge of Night and Another World. He died April 23 1971 at age 68. The station's history traces back to 1924, when Alfred H. Grebe started WAHG at 920 AM. WAHG was a pioneering station in New York, and was one of the first commercial radio stations to broadcast from remote locations including horse races and yachting events. Two years later, in 1926, Alfred Grebe changed the station's call sign to WABC (for his Atlantic Broadcasting Company) after concluding a business arrangement with the Ashland Battery Company (which had owned the call sign for a station in Asheville, North Carolina) and moved his studios to West 57th Street, which would not be the last time the station would operate from 57th Street. 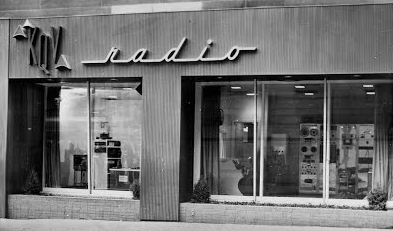 In 1928, General Order 40 moved the station's frequency to 970 AM, and the station became a part-time affiliate of the Columbia Broadcasting System, which was looking for a full-time radio presence in New York City (CBS's first flagship was WOR). After a short time broadcasting CBS programming three days a week, CBS president William S. Paley purchased WABC and it became a subsidiary of CBS. 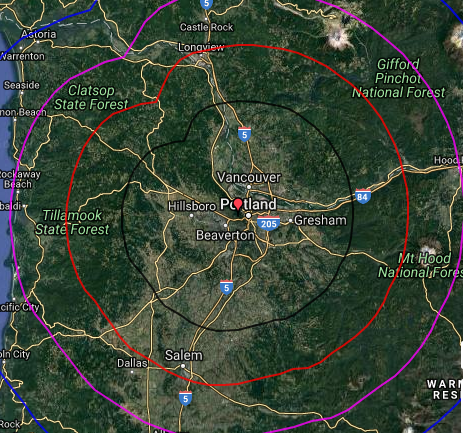 Soon after this purchase the station moved to a new frequency, this time to 860 AM, and would eventually increase its transmitting power from 5,000 to its present 50,000 watts. The station also moved its studios into the CBS headquarters at 485 Madison Avenue (on the corner of 52nd Street). The station, still operating as WABC, featured a mix of local interest programming, ethnic content and music programs from CBS's national feed. As time went by, WABC turned more and more to the national programming provided by CBS and its affiliates, and its broadcast day was influenced by CBS's growing interest in news programming. In 1939, the broadcasting operations were moved across 52nd Street from the headquarters to the new CBS Studio Building. In 1941, WABC moved to the frequency it currently occupies, 880 AM, and changed its call letters to WCBS on November 2, 1946, to identify more closely with its parent network, the Columbia Broadcasting System or CBS, and avoid possible confusion with the rival network of the American Broadcasting Company (ABC), which had begun operation in 1943. As a result, this station has no relation to the longtime ABC radio flagship station on 770 AM that began in 1921 as WJZ, and has operated as WABC since 1953. ➦In 1926...KYA San Francisco, California was licensed. It signed-on 12/18/1926. KYA went on the air on 18 December 1926, with 500 watts on 970 kHz from the Clift Hotel in San Francisco. The owners were Vincent I. Kraft of Seattle, who had started KJR (AM) there; and Frederick C. Clift of San Francisco. It got a license for 1000 watts on 850 kHz in November 1927. Its studios moved to the Warfield Theatre Building at 988 Market Street, but the transmitter stayed at the Clift Hotel. In November 1928 moved to 1230 kHz as part of a nationwide frequency reshuffling, and joined the Columbia Broadcasting System. By May 1929 its transmitter was reported to be at 680 Geary Street at Taylor Street. The station licensee went bankrupt in August, and KYA was transferred to a new corporation by the end of 1929. The transmitter facility was moved again, on 25 June 1930, to the Whitcomb Hotel. Having moved to various locations around the radio dial during the chaotic early days of broadcasting, KYA was assigned permanently to 1260 kHz as a result of NARBA in 1941. In the mid-1950s, KYA made its mark as a rock and roll station. KYA was for many years the leading Top 40 music radio station in the Bay Area, until the stronger-signalled KFRC switched to the format in 1966. From time to time, up through 1970, KYA would again beat KFRC in the Arbitron ratings, but KYA's dominance was truly over after the mid-60's. Former KYA morning man and legendary radio programmer Bill Drake went on to consult KFRC to its ratings success; it was at KYA that Drake first made his mark as program director. KYA was also instrumental in the careers of future sportscaster Johnny Holliday, audio and electronics store pitchman Tom Campbell, Hall of Fame disc jockey and underground radio pioneer Tom Donahue (a/k/a "Big Daddy"), and Tommy Saunders, who retired from KYA's successor, KOIT, in 2006. 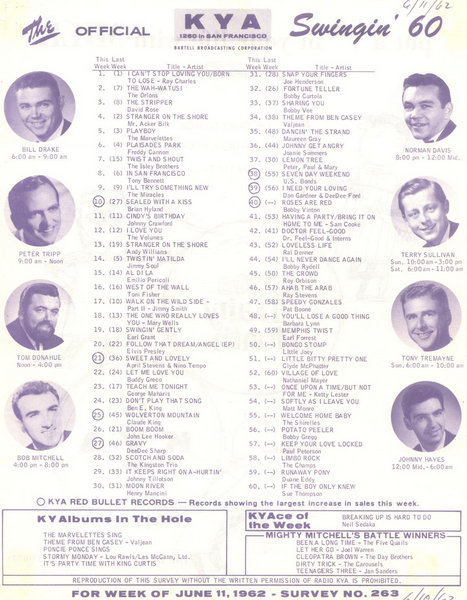 Other notable disc jockeys who plied their trade on KYA's airwaves in the 1960s included Les Crane, (air name Johnny Raven), Casey Kasem, Jim Stagg, Bobby Mitchell, Norman Davis, "Emperor" Gene Nelson, Peter Tripp, Tony Bigg, Russ "The Moose" Syracuse, Chris Edwards, Ed Hider, Johnny Holliday, Bill Holley (a cousin of Buddy Holly), Bwana Johnny, and Gary Shaffer. The 1970's saw a staff that included Christopher Cain, Roger W. Morgan, Jay Stone, Scott Thomas, Steve Jordan, Jimmy "Jet" Powers, Gary Mora, and Michael Rivers. In December 1979, KYA AM & FM flipped to a light album rock format under the title "Easy Rock 93." Within months the AM station would flip again, this time to an oldies format while the FM station would continue the light album rock format as KLHT (K-LITE). Morgan, Mora, and Syracuse would be brought back to revive the station from its heyday. This format would hold until the station was sold in 1983. KYA's dominance was basically over by the late 1960s when FM stations began playing rock 'n' Roll and gained large chunks of the audiences. In mid-2007, Bonneville reached an agreement to sell the 1260 AM frequency to IHR Educational Broadcasting. IHR took over the station's operations in December of that year under a time-brokerage agreement, and officially closed on the station on February 1, 2008. In 2007, KOIT-AM, the former 1260/KYA, became KSFB, a Catholic-oriented station owned by Immaculate Heart Radio. Ironically, KYA's chief Top 40 rival in the 1960s and 1970s, KFRC (610 AM), is now the Christian-oriented KEAR (the KFRC call letters would return in January 2009, this time at 1550 AM replacing KYCY and the station is owned by CBS Radio). On December 10, 2007, a religious format came to 1260 AM; the call sign was changed to KSFB. KSFB is part of one of the largest Catholic radio network in America, and its daily broadcasts include daily mass and rosary. ➦In 1936...Edgar Bergen became the first ventriloquist to successfully perform on national radio as he and Charlie McCarthy appeared on NBC's "The Royal Gelatin Hour," hosted by singer/bandleader Rudy Vallée. ➦In 1955...Carl Perkins wrote "Blue Suede Shoes." Less than 48 hours later, he recorded it at the Sun Records studio in Memphis. ➦In 1963...Carroll James Jr. became the first American Disc-Jockey to air a Beatles record on radio station WWDC in Washington, DC. That was two months before the Beatles were on the “Ed Sullivan Show.” Carroll played ‘I Want To Hold Your Hand’, which he’d obtained from his stewardess girlfriend, who brought the single back from the UK. James won a place in Beatles mythology as the first disk jockey to play the group's records on American radio. But D. L. MacLaughlan, a Beatles researcher at UCLA, has found playlists and top-40 charts from radio stations around the country that predate Mr. James's broadcast by as much as 10 months. The earliest was WLS in Chicago, which began playing ''Please Please Me'' in February 1963. 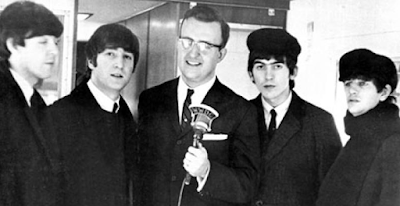 Nevertheless, the Beatles and Capitol considered Mr. James's advocacy helpful, and invited him to be the master of ceremonies at the group's first American concert, at the Washington Coliseum. James died from cancer in 1997. ➦In 1976...Ted Turner's WTCG-TV in Atlanta changed call letters to WTBS and its signal was sent via satellite to cable systems all over the U.S. – the first commercial TV station to cover the entire country – making it the first TV "Super Station." ➦In 1986...Wayne Newton won a $19.2 million suit against NBC News. The network had aired reports claiming a link between Newton and mob figures, reports later proven to be false. ➦In 1987...WPLJ NYC calls were changed to WWPR ("World Wide Power Radio") and 95.5 became "Power 95." 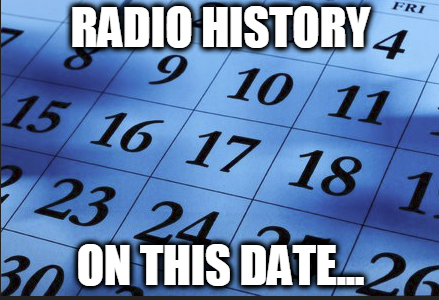 However, a year later - December 21, 1988 - calls were changed back to WPLJ and "Power 95" was dropped. 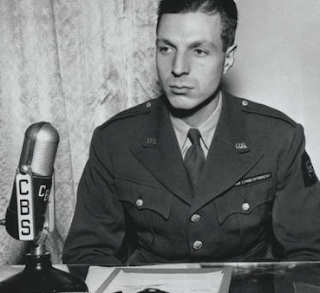 ➦In 2014…Richard C. Hottelett, who spent more than four decades reporting news for CBS and was the last of the original "Murrow's Boys," wartime journalists hired in the 1940s by Edward R. Murrow, died at the age of 97. ➦In 2016…Radio personality (Rockline, Los Angeles stations KLOS, KCBS-FM, KMET, KZLA, KLSX) Bob Coburn died of lung cancer at age 68. KQV 1410 AM — with a broadcasting history that dates back nearly 100 years, the last 42 of them with a rare all-news format — is preparing to go off the air at year’s end. 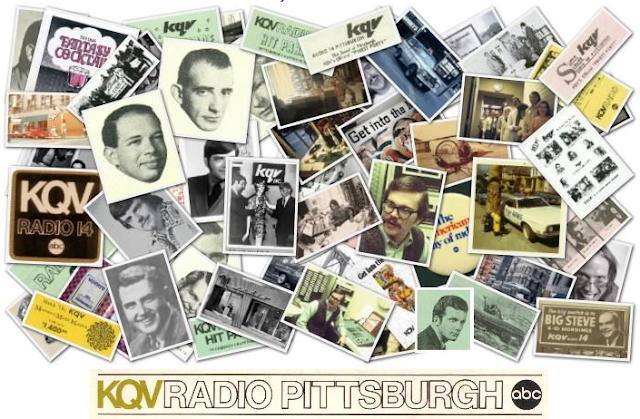 The Pittsburgh Post-Gazette reports Robert W. Dickey Jr., the station manager whose family has owned or co-owned the station since 1982, delivered that news Friday morning to most of his 20 employees gathered in the KQV office at Centre City Tower Downtown. The station made no immediate on-air announcement and doesn’t plan any until Dec. 31, Mr. Dickey said. He calls the plan a “suspension” of broadcasting, allowing for the possibility some investor or buyer may come along in the interim, though he’s made no active efforts to sell KQV. Mr. Dickey, 61, whose sister and business partner, Cheryl Scott, died last month, said KQV would continue all of its existing programming until the end of the year. After that, he’s not sure what, if anything, anyone will hear when tuning in the future to 1410. “If you tune to us on Jan. 1, you probably won’t hear anything,” he said. That will be a switch for many Pittsburghers, whether they are news junkies or baby boomers who grew up in the 1960s and early ‘70s using KQV as their source to first hear rock music. As FM became the primary format to hear music on the radio, KQV switched to an all-news-all-the-time format in 1975. Mr. Dickey’s father, the late Robert W. Dickey Sr., was a station manager who got financial backing from billionaire Richard Mellon Scaife to form Calvary Inc. and purchase the station from Taft Broadcasting in 1982. The senior Mr. Dickey died in 2011, and before Mr. Scaife’s own death, he sold his shares to the Dickey family in 2013. Mr. Dickey Jr. and his sister ran it, with her as president and business manager, and Mr. Dickey said it became clear it would be increasingly difficult after her recent passing to continue. The news format, due to the salary costs of the necessary number of reporters, editors and announcers involved, is much more costly than music programming on radio, Mr. Dickey said. But he did not consider a format change at the station, he said, because of his family’s longtime focus on delivering news as a mission. 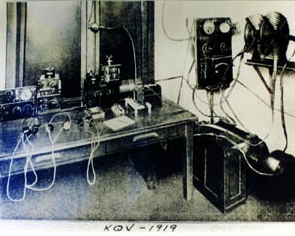 The FCC has traditionally listed KQV's establishment date as January 9, 1922. However, station management has generally traced its history to predecessor activities beginning on November 19, 1919, although documentation for this earlier period is limited. In addition, station co-founder F. C. Potts maintained that the station should only be considered to date to late 1921, when the first license with the KQV call letters was issued. According to Wikipedia, KQV's original owner was the Doubleday-Hill Electric Company. Doubleday-Hill was a well established seller of electrical equipment, whose offerings included radio equipment (then also called "wireless"). 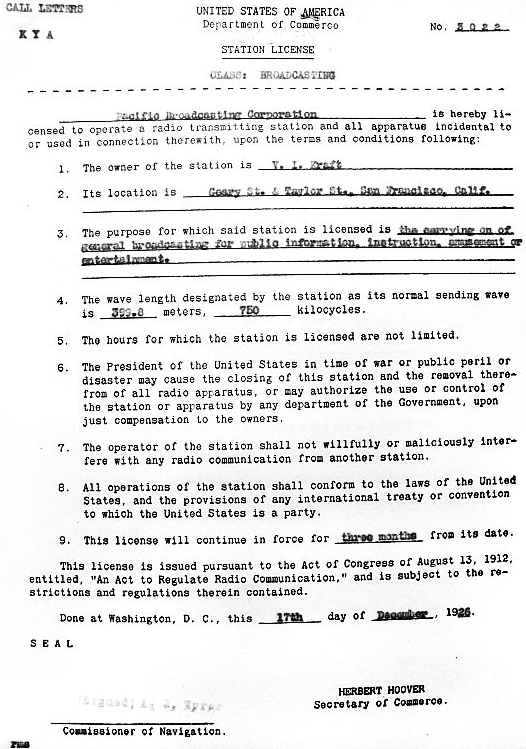 During World War One the U.S. government had prohibited the operation of radio transmitters by civilians, and the ban wasn't lifted until October 1, 1919. Shortly thereafter, Doubleday-Hill's radio department manager, Francis C. Potts, announced that the company was in the process of installing a De Forest radiotelephone transmitter, to be used for communication with a second station to be located at the company's branch store in Washington, D.C. A month later, in late November, Potts reported that the company had been unable to obtain the commercial license needed to operate the business plan, however, "a special amateur license has been applied for, to cover the wireless telephone demonstration station which the company has ordered installed and which is expected to be opened in the near future". In late January 1920 it was announced that "The latest type of radiophone, developed and produced in the laboratory of Dr. Lee De Forest at New York, has just been installed in the downtown store of the Doubleday-Hill Electric Company. 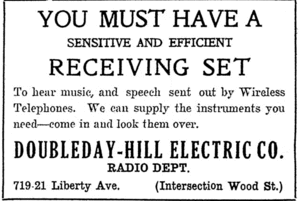 A week later it was reported that "On last Tuesday evening [January 27, 1920], the Doubleday-Hill Electric Company made a preliminary test of their new radiophone equipment, by rendering a short concert of about 15 selections, including many popular numbers, as well as operatic and classical pieces." Two weeks later saw the announcement that "The radiophone musical concerts promised the local amateurs by Doubleday-Hill Co. will start this week and be given regularly hereafter on a schedule which is, for the present, Tuesday and Thursday evening, from 7 to 10 p. m. All the latest popular music will be played and records changed for each concert. Messrs. Williams and Devinney will operate the radiophone for these concerts." KQV's initial license in the fall of 1921 was the first one issued in the name of Doubleday-Hill, and the first to receive the KQV call letters. Moreover, in the same September 1934 newspaper article in which the KQV staff dated the station's founding to the predecessor 1919 activities, F. C. Potts was quoted as stating that in his opinion KQV's founding shouldn't be considered to have occurred until two years years later, when the first KQV license was issued, endorsing an earlier slogan that the station was "On the Air since 1921". On November 11, 1928, a major reallocation resulting from the Federal Radio Commission's General Order 40 assigned KQV to a "regional" frequency, 1380 kHz. In 1932 the station was sold to H. J. Brennan. On March 29, 1941, under the provisions of the North American Regional Broadcasting Agreement, all the stations on 1380 kHz were shifted to 1410 kHz, which has been KQV's dial position ever since. 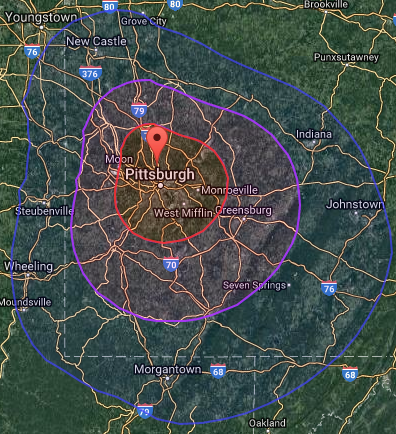 In 1944 the station was sold to Allegheny Broadcasting — the sale was necessary because both KQV and WJAS were under common ownership, and the FCC no longer permitted multiple AM station ownership within a community. A 1947 station advertisement, promoting its power increase to 5,000 watts, described KQV as "Pittsburgh's Aggressive Station". In 1957 the station was once again sold, this time to the American Broadcasting Company-Paramount (ABC). During the late 1950s, 1960s and 1970s KQV was quite successful as a top 40 station, with Count John K. Chapel a popular radio personality during most of this period. Known over the years as "Colorful KQV," "Audio 14," "Groovy QV," and "The Big 14", KQV premiered its top 40 format on January 13, 1958, and is remembered for its high-profile, high-energy personalities, such as Robert Wolfson a.k.a. Bob Wilson, Chuck Brinkman, Hal Murray, Dave Scott, Steve Rizen, Dex Allen, Jim Quinn, future game show announcer Rod Roddy, and their large-scale promotion of a Beatles concert at Pittsburgh's Civic Arena in 1964. 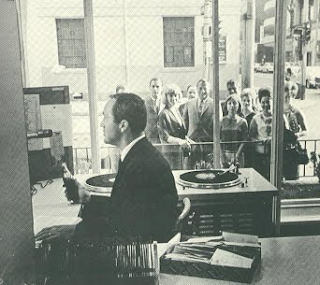 During this time KQV broadcast from its showcase studios on the ground floor of the Chamber of Commerce Building ("on the corner of Walk and Don't Walk," as the DJs would say) in downtown Pittsburgh, where the disk jockeys could be watched through a large window. The station was dominant among young listeners throughout the 1960s, and was a major force introducing Pittsburgh to new music and artists such as Sonny & Cher, the Rolling Stones, the Supremes, the Beach Boys, the Dave Clark Five and others. KQV ratings began to slowly decline after 1970, with the rise of FM radio (including its then-sister station WDVE, which had begun operation in 1948 as KQV-FM). 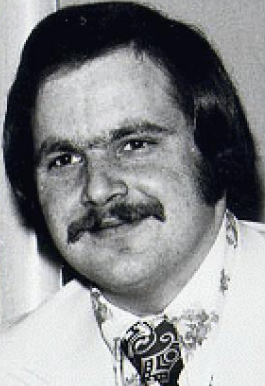 One of KQV's top-40 personalities in the 1970s, with the on-air name of "Jeff Christie," later became famous as a talk-show host under his real name, Rush Limbaugh. In 1974, another upstart competitor — AM station "13Q" WKTQ, the former (and current) WJAS — also made serious inroads competing against KQV, which briefly turned to the "14K" brand. At the end of the year, ABC Radio sold both KQV and WDVE to Cincinnati-based Taft Broadcasting. Taft made another attempt at Top 40 on KQV, this time with a far more radical presentation, with Joey Reynolds as program director, before dropping the format altogether. Its final night as a top 40 station was October 14, 1975, with Neil Diamond's "Brother Love's Travelling Salvation Show" played as the final song. 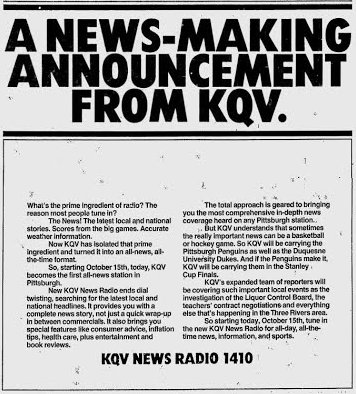 The next morning, October 15, 1975, KQV switched to its present all-news format, carrying NBC Radio's 24-hour News and Information Service. Even though NBC cancelled this service two years later, KQV continued as an all-news station with local elements. In 1982 Taft executives told KQV's general manager, Robert W. Dickey (no relation to the Dickey family that founded the Cumulus Media conglomerate), that it intended to sell the station. Hoping to avoid a potential format change that often results from an ownership shift, Dickey decided to make a bid to buy the station. He received financial backing from newspaper publisher Richard Mellon Scaife and together they formed Calvary, Inc., purchasing the station from Taft that same year. 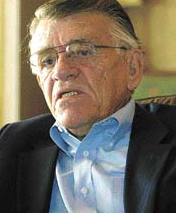 Dickey died on December 24, 2011, his estate remained a partner in the station's ownership, with Robert W. Dickey Jr. succeeding his father as general manager. Dickey Jr.'s sister and station co-owner, Cheryl Scott, died in November 2017 at age 65. On May 14, 2013, it was announced that Richard Mellon Scaife was selling his shares in KQV to the Dickey family, giving the Dickeys full ownership. Scaife died a year later. Sports radio legend Mike Francesa bid the WFAN 660 AM & 101.9 FM audience he entertained for 30 years farewell Friday with one last show. The callers who lit up the airwaves since 1987 expressed their gratitude and admiration for Francesa, who took one final bow before beginning the next chapter of his illustrious career. He closed out his show by thanking his fans. ALSO READ: From Barrett Sports Media...Thank-you Mike Francesa. Click Here. The top U.S. Senate Democrat said on Friday he would force a vote on the Federal Communications Commission’s decision to repeal landmark net neutrality rules, but the move was unlikely to block a ruling that could reshape the digital landscape. The FCC voted Thursday along party lines to reverse the Obama era rules barring internet service providers from blocking or throttling internet traffic, or offering paid fast lanes. A group of state attorneys general vowed to sue. And now Reuters reports Senator Charles Schumer of New York on Friday said he would force a vote on the FCC action under the Congressional Review Act. Republicans scuttled internet privacy rules adopted under the Obama administration using the same procedural vehicle. Senate Majority Leader Mitch McConnell opposes Schumer’s effort and backed the FCC repeal, a spokesman for the Republican said Friday. A reversal of Thursday’s FCC vote would need the approval of the Senate, U.S. House and President Donald Trump. Trump also backed the FCC action, the White House said Thursday. This week’s FCC order grants internet providers sweeping new powers to block, throttle or discriminate among internet content, but requires public disclosure of those practices. 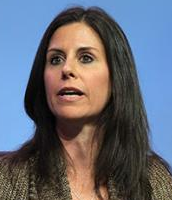 Internet providers have vowed not to change how consumers get online content. The FCC rules also seek to bar states from imposing their own net neutrality requirements. Meanwhile, Kim Komando has posted a "My Take" piece on Net Neutrality. According to Komando, tech giant Google helped write the 2015 net neutrality rules and Google, YouTube, Amazon, Twitter, Snapchat, Facebook and the others were trying to assume a kind of moral high-ground, to control the flow of data. According to Komando...“Net Neutrality” would have given the Federal Government and big tech the power to choose winners and losers online, in an egregiously partisan manner. 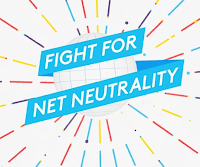 “Net Neutrality” said nothing about neutrality and everything about governmental control and nepotistic picking of favorites, which is the very opposite of neutrality. The Federal Communications Commission plans to fine Sinclair Broadcasting Corp $13.3 million after it failed to properly disclose that paid programming that aired on local TV stations was sponsored by a cancer institute, three people briefed on the matter told Reuters. The proposed fine, which covers about 1,700 spots including commercials that looked like news stories that aired during newscasts for the Utah-based Huntsman Cancer Institute over a six-month period in 2016, could bolster critics of Sinclair’s proposed $3.9 billion acquisition of Tribune Media Co. The proposed fine, which was approved by the five-member FCC earlier this week but has not yet been made public, is significant, officials said. The penalty represents an average fine of about $7,700 for each of the improperly aired spots but is significantly less than the maximum fine Sinclair could have faced under the law. Sirius XM Holdings Inc. will pay almost 41% more for the music it plays on its satellite-radio service starting next year, the federal Copyright Royalty Board decided late Thursday, though labels and artists feel the increase still falls short. The Wall Stree Journal report that beginning in 2018, SiriusXM will pay 15.5% of gross revenue through 2022. The rates for these types of compulsory, government-issued licenses that radio-type services rely on for music are decided every five years. “For more than a decade, SiriusXM pocketed billions of dollars on the backs of music creators by paying below-market rates while the company crowed about record profits and boasted a market cap about the size of the entire recorded music market,” said Mr. Sherman in a statement. SiriusXM currently pays 11% of its revenue to SoundExchange Inc., which collects digital performance royalties on behalf of record companies and artists. 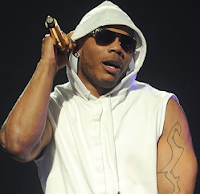 SoundExchange then distributes that payout to artists and labels based on how often their music is played. By law, half goes to the copyright owner—usually a record label—and half goes to the performer of a song. SoundExchange had proposed the new rate for Sirius either be more than doubled to 23% of revenue or be $2.48 per subscriber a month in 2018 with moderate annual increases—whichever is greater. 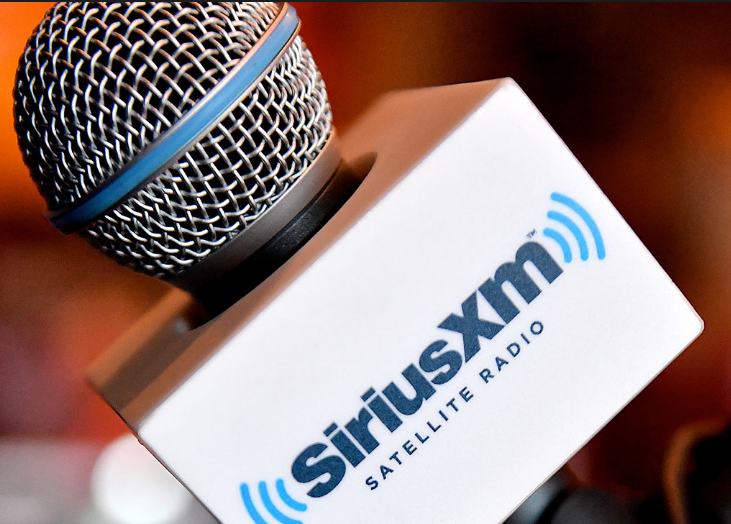 SiriusXM had more than 32 million subscribers at the end of the third quarter. About five million of those get the service free as part of a promotion like those car companies frequently offer. It reported $5 billion in revenue last year. Meanwhile, the Copyright Royalty Board lowered the rate paid for cable and satellite TV music services provided by Music Choice and Muzak. These “preexisting subscription services,” which currently shell out 8.5% of gross revenue, will pay 7.5% for the next five years. 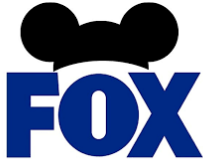 The expected synergies to come from Disney’s $52.4 billion purchase of most of Twenty-First Century Fox’s assets could mean job cuts of between 5,000 and 10,000 at the Mouse House once the deal closes, one media analyst said. Disney, in announcing the dramatic acquisition on Thursday, said it expected “synergies” in combining the Fox assets with its own to range up to $2 billion. Synergies are often code for layoffs. But, reports The NYPost, BTIG media analyst Rich Greenfield, in a report, said the synergies could swell to $2.5 billion. To get to its $2 billion goal, Disney will have to cut well over 5,000 jobs, Greenfield said. That number could range as high as 10,000. Disney declined to comment on the job cut estimate. Walt Disney Co. Chief Executive and Chairman Robert Iger could receive as much as $142 million worth of stock, at the current share price, under a new employment agreement he signed along with his company’s deal to acquire assets of 21st Century Fox Inc, according to The Wall Street Journal. 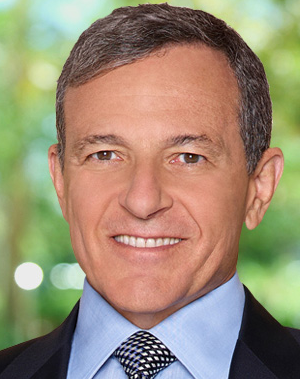 Iger’s new compensation structure came as the board of directors said it would extend his contract through 2021, from July of 2019, should the Fox deal close. The amended employment agreement calls for Mr. Iger to receive restricted stock units worth about $27 million at the current share price in four installments between 2018 and 2021, according to a regulatory filing. He is also eligible for additional equity awards that would be worth $115 million at the current share price. Those equity awards are performance-based and depend on Disney’s total shareholder returns compared with the total shareholder returns of the S&P 500 index. He will receive a bump in his base salary almost immediately, however, to $3 million as of Jan. 1 from $2.5 million currently. If the deal is completed, his salary will grow to $3.5 million. Once he is running Fox’s film and TV studio, cable networks, satellite services and other assets along with Disney in its current form, Mr. Iger’s annual target bonus, which is based on performance, would be increased to $20 million from $12 million. In fiscal 2016, he received $20 million, substantially more than the $12 million target, because his performance exceeded expectations. His target long-term compensation award, a mixture of stock and options, will be $25 million. In fiscal 2016, he received $17.3 million. Facebook said Friday that any harm brought about by social media is caused by user error. “According to the research, it really comes down to how you use the technology,” David Ginsberg, Facebook’s director of research, wrote on a blog post. The post — “Hard Questions: Is Spending Time on Social Media Bad for Us?” — was aimed at countering harsh attacks the social network had taken the past couple of weeks. 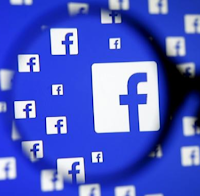 Critics claim Facebook and other social media were cheapening relationships across the country. While Facebook admitted that in certain circumstances it can be bad for your health, most troublesome issues are caused by users. “Just like in person, interacting with people you care about can be beneficial, while simply watching others from the sidelines may make you feel worse,” Ginsberg wrote in the blog post co-authored by Moira Burke, a research scientist. The duo pointed to one experiment, which found that users who passively used Facebook — scrolling through their news feed and looking at posts and photos — were generally less happy than those who used the platform to engage with friends and loved ones. The blog post comes the same week that a former Facebook executive was revealed to have bashed social media in general during a November talk at Stanford University. 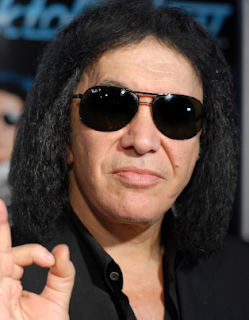 According to The San Bernardino Sun, the lawsuit was filed in Los Angeles Superior Court and alleges the plaintiff, identified as “Jane Doe,” arrived with her crew at the restaurant, which was celebrating its recent expansion at the casino, to interview Simmons and his longtime Kiss bandmate and Rock & Brews co-founder, Paul Stanley. The growth of the smart speaker market continues with 22% of U.S. broadband households planning to buy one this year. MediaPost cites new research from Parks Associates found that more than one in five consumers plan to purchase a voice-controlled smart speaker with a personal assistant in 2017. 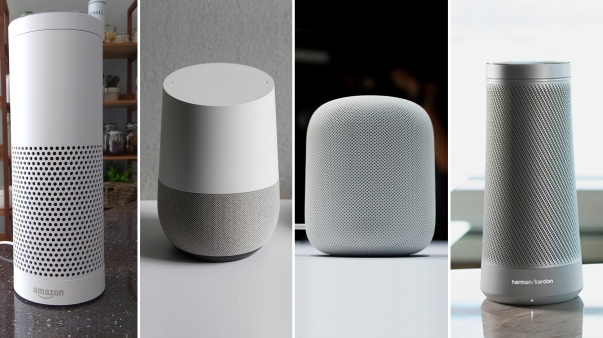 Interest in the category is growing along the introduction of new devices and the expansion of others, such as the increasing number of models of Amazon Echo and Google Home devices. "It's still early days for the voice-first market, but rapid early adoption of products like smart speakers with personal assistants, at 12% of U.S broadband households by year-end 2016, demonstrates the need and demand for a natural and easy-to-use interface," stated Dina Abdelrazik, research analyst, Parks Associates. "Natural language processing for voice technologies happen in the cloud, so real-time updates can be made quickly once consumer realities unfold. Multiple channels, from custom to direct-to-consumer retail, will focus on expanding the voice-enabled UX in 2018." Both Amazon and Google deeply discounted their smaller devices, the Amazon Echo Dot and Google Home Mini, for the holidays. Stuart Evey, who as an executive for Getty Oil recommended that the company invest in the start-up that became ESPN and then took an active role in its management for five years, died on Dec. 8 in Spokane, Wash. He was 84, according to The NYTimes. Evey, who oversaw Getty’s non-petroleum businesses, was asked in late 1978 to evaluate a plan for an all-sports network. In those early days of cable programming, there were few channels, let alone any that televised sports 24 hours a day, as Bill Rasmussen, a former hockey team executive, was proposing. Seven other companies had rejected Rasmussen’s pitch, and he was running out of money. “Bill came to my office very disgruntled because he knew, in his mind apparently, that there’s no way an oil company would ever be interested in what he had in mind,” Evey old the authors James Andrew Miller and Tom Shales for the book “Those Guys Have All the Fun: Inside the World of ESPN” (2011). Rather than spurn Rasmussen, Evey was intrigued. But there was not much dependable information about the nascent cable industry to analyze. Networks like CNN and MTV had not yet started. And television executives like Roone Arledge, who had revolutionized sports coverage at ABC, told Evey that an operation like ESPN had little chance of succeeding. Evey persuaded the Getty board to invest $10 million in ESPN for an 85 percent stake, with Mr. Rasmussen and his family owning the rest. It was a critical investment. The network went on the air on Sept. 7, 1979, and eventually became the largest force in sports media. ➦In 1898...drummer/bandleader Lud Gluskin was born in Manhattan. He became director of music at CBS in 1937, and his work was heard all over the radio dial on programs originating in Hollywood for the next 15 years. He led the orchestra for a year or two of Amos ‘n’ Andy, Suspense, My Friend Irma, Life with Luigi, My Little Margie, Sweeney & March, The Philip Morris Playhouse, Campana Serenade, and dozens of lesser-known, lower-budget programs. He died Oct. 13 1989 at age 90. ➦In 1901...Guglielmo Marconi was officially notified by the Anglo-American Telegraph Company that it would take legal action against him unless he immediately ceased his wireless experiments and removed his equipment from Newfoundland. Anglo-American had a fifty-year monopoly on electrical communications in Newfoundland, that began in 1858, and it was determined to hinder radio telegraphy, which was a serious threat to its transatlantic electric telegraph business operated by submarine cables. Marconi soon decided to move his base of operations to Cape Breton Island, and was welcomed there on Dec. 26 with open arms. 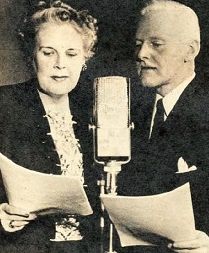 ➦In 1907...Well known opera performer Eugenia H. Farrar became the first person to sing on the radio. Lee De Forest transmitted her voice from the Brooklyn Naval Yard in New York during the departure of Admiral Robley Dunglison Evans on a cruise with the fleet. ➦In 1925..Dynamic loudspeaker is designed by Chester Rice and Edward Kellogg. ➦In 1951...After more than two years on radio, the TV pilot episode of "Dragnet" aired on NBC. The series, starring and created/produced by Jack Webb, ran until August 1959, then returned from 1967 to 1970. Dragnet ran on NBC radio from June 3, 1949 to September 20, 1955 with repeats lasting until February 26, 1957. ➦In 1990...KUSW, Salt Lake City, Utah, ended shortwave radio transmissions. ➨In 1993...KEZK in St. Louis became the first U.S. radio station to ban Michael Jackson records following recent allegations of Jackson's child sexual abuse. ➦In 2005...Howard Stern did his last terrestrial radio show for Infinity Broadcasting's WXRK-FM (changed to CBS Radio) before moving on to SIRIUS Satellite Radio. ➦In 2006...Paul McCartney left EMI, his record label for 45 years, saying it had become "boring" and he "dreaded going to see" its executives. McCartney told The London Times that the company's handling of his music had become "symbolic of the treadmill." 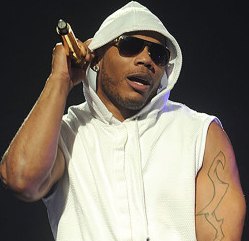 He later signed with Hear Music, the Starbucks label. ➦In 2007...Singer/songwriter (Longer, Same Old Lang Syne, Hard To Say, Leader Of The Band, Run For The Roses) Dan Fogelberg died of prostate cancer at 56. ➦In 2010...Larry King ended his CNN talk show after 25 years. 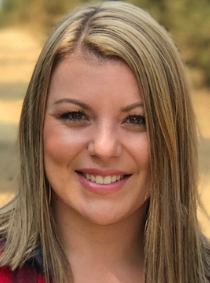 KUPL 98.7 The Bull (KUPL) brings Jenn Hays to Portland to join Tony and Jake in Mornings. The new show “Bull Mornings with Tony, Jake and Jenn” launches Monday, January 8th. Jenn is originally from Oregon, having spent the past couple of years working in Billings, Montana. St. Jude Children’s Research Hospital partner iHeartMedia mobilized 26 radio stations across the nation and collectively raised more than $5.6 million during the annual Country Cares for St. Jude Kids national radiothon, December 7 – 8. The fundraising event encouraged radio listeners to pledge $20 per month to become “Partners In Hope” with St. Jude. The event was supported across iHeartMedia markets in conjunction with The Bobby Bones Show – iHeartMedia’s nationally syndicated award-winning country morning show – and the $5.6 million raised in just two days this year marks iHeartMedia’s largest national campaign. Also, more than 80 country artists supported the St. Jude ‘This Shirt Saves Lives’ campaign in addition to the radiothon. The social media push and on-air promotion through Country Cares radio partner stations attracted thousands of new Partners in Hope and sustaining donors in support of the life-saving research and treatment being done at St. Jude. Artist and donor social posts can be viewed at www.thisshirtsaveslives.org. St. Jude and iHeartMedia have enjoyed a longstanding partnership for more than 30 years, generating more than $90 million in the past decade to treat St. Jude patients by relying on the power of radio and the generosity of local listeners. Like this year’s successful radiothon, many times in past years iHeartMedia stations have come together to support St. Jude patients and families who never receive a bill from St. Jude for the cost of treatment, travel, housing or food. 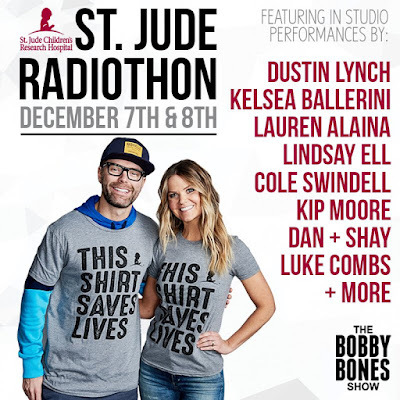 The Bobby Bones Show generated more than $1.7 million with the help of several artists including Lauren Alaina, Kelsea Ballerini and Cole Swindell. Additionally, throughout the year, The Bobby Bones Show supports many St. Jude programs such as the star-studded Bobby Bones & The Raging Idiots’ Million Dollar Show in January at the historic Ryman Auditorium in Nashville, Tennessee. Participating iHeartMedia radio stations include: WMZQ Washington, DC; WAMZ Louisville; WGAR Cleveland; WKKT Charlotte; WBWL Boston; KTOM Salinas, CA; WSIX Nashville; KASE Austin; KWNR Las Vegas; WMIL Milwaukee; WNCB Raleigh; KTST Oklahoma City; WQIK Jacksonville; KODA Houston, among others. KEEY in Minneapolis, and San Antonio’s KAJA air this week. The FCC voted on Thursday to repeal Obama-era net neutrality rules, which required internet service providers to offer equal access to all web content without charging consumers for higher-quality delivery or giving preferential treatment to certain websites. The FCC chairman has long argued against the rules, pointing out that before they were put into effect in 2015, service providers had not engaged in any of the practices the rules prohibit. The Hill reports Thursday’s vote is unlikely to end the fight over the popular consumer protections. Public interest groups have already vowed to challenge the move in court and Democrats plan to push legislation that would block it from going into effect as Republicans renew their calls for a legislative compromise that would put the issue to rest. Minutes after the vote, multiple state attorneys general, including those from Washington and New York promised to sue the FCC to overturn the ruling. Meanwhile, Democrats are hoping to paint the repeal of the rules by the FCC, which is now chaired by President Donald Trump appointee Ajit Pai, as evidence Republicans are uninterested in young people and consumer concerns at large, Reuters reports. Rupert Murdoch is banking on Americans’ love of live sports and breaking news for a new, slimmed down version of his Fox TV business after selling the company’s film studios and international operations to Walt Disney Co (DIS.N). Reuters report the 86-year-old media mogul’s play is based on the fact that sports and news still attract viewers watching in real time - and the advertisers that want to reach them - even as more people watch their favorite shows on demand after they air or online, skipping commercials completely. Disney’s $52.4 billion purchase of Twenty-First Century Fox’s (FOXA.O) film, television and international businesses, announced earlier on Thursday, leaves Fox with a smaller but more focused set of assets, based on Fox News Channel - the U.S. No. 1 news cable network - and its broadcasts of sports such as National Football League and Major League Baseball. Murdoch, who started in the news business 65 years ago when he inherited his father’s newspaper, is keen to adapt to new ways of reaching customers. The new Fox will keep the technology it has been working on and is developing an online streaming video service to boost online audiences for its programs, executives said. The new Fox will be about a third of the size of what it is now, with about $10 billion in annual revenue, company executives said. If investors value the new company with the same or a greater multiple as the current Fox, it would suggest a market value of at least $20 billion. Its smaller size may mean it has less leverage when negotiating with cable and satellite companies to carry its content or bidding for sports rights to air on its network. Nevertheless, Murdoch challenged investors to trust him, saying he faced similar doubts when he launched Fox News 21 years ago and Fox Sports 1 in 2013. “Content and news relevant to you will always be valuable,” Murdoch said. 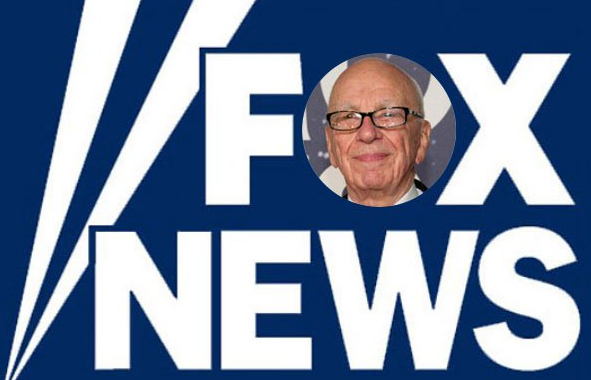 Murdoch is also banking on Fox News Channel continuing its success as the top-rated cable news network, despite the fact that the median age of Fox News’ viewers is over 65, according to Nielsen. The median age of rival MSNBC’s viewers is also over 65, while CNN’s is 59. 86-year-old media mogul Rupert Murdoch and his family would emerge as the single largest individual shareholders in Disney once the proposed $66 billion deal for 21st Century Fox’s film and television assets closes. Only the mutual fund Vanguard would have more significant holdings in the Burbank media giant. According to Deadline.Hollywood, the Murdochs stand to receive nearly 88 million Disney shares in the all-stock deal, based on the number of Fox shares he and his family trust reported in regulatory filings. That’s more than the 64 million shares owned or directly controlled by Laurene Powell Jobs, the widow of Steve Jobs. The late Apple co-founder became Disney’s largest individual shareholder in 2006 with the $7.4 billion sale of Pixar Animation Studios. Media analyst Doug Creutz of Cowen & Co. speculates that the Murdochs may be positioning themselves to run Disney one day, after CEO Bob Iger retires. That’s consistent with what we’re hearing from sources, who say James Murdoch is angling for a senior management role in Burbank. 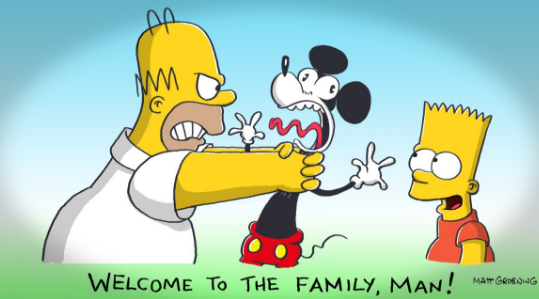 Iger, however, was circumspect today about the younger Murdoch’s role in the company, post-acquisition. “James and I will be talking over the next number of months. He’s going to be integral to the integration process, and he and I will be discussing whether there is a role for him or not at our company,” Iger said. If Washington regulators approve Disney’s acquisition of a large part of Twenty-First Century Fox’s assets without forcing any divestitures, ESPN will gain 22 regional sports networks. The NYPost reports those RSNs hold the broadcast rights for 44 of the country’s 81 professional sports teams — and have 61 million subscribers, according to Fox. Pay-TV subscribers consider RSNs the fifth-most important channels in their packages, a Nielsen survey last year revealed. In some sports-obsessed markets, RSNs even ranked higher than the broadcast networks, the survey found. ESPN — 80-percent-owned by Disney — has lost 13 million subscribers since reaching a peak of 100 million households in 2011. Among the RSNs included in the asset sale to Disney is Fox’s 80 percent interest in the YES Network, which airs the games of MLB’s New York Yankees, the NBA’s Brooklyn Nets and soccer’s New York City FC. 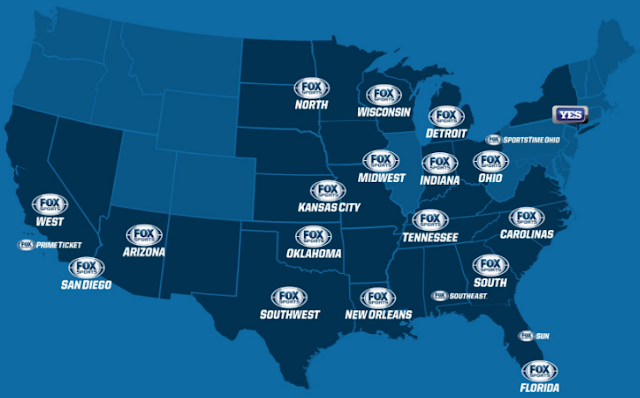 By league, the Fox RSNs control the local cable rights to 15 MLB teams, 17 NBA teams and 12 NHL teams. The collection made Fox the country’s No. 1 owner of RSNs. Their acquisition by Disney demonstrates an abiding faith in sports programming, despite well-documented problems at ESPN. Meeting with Entercom CEO David Field and CFO Rich Schmaeling face-to-face for the first time since the closing of the historic merger, Ryvicker says she also learned that cost synergies laid out by the company are likely conservative and there is more upside than downside risk for investment. InsideRadio reports Ryvicker says there isn’t one “major overhaul” that will fix CBS Radio. Instead, little changes like bringing in new market managers, investing in research and analytics to find programming holes in a market and improved cultural changes will right the ship. Entercom has said post-merger cost synergies will save over $100 million. Ryvicker believes that is a conservative number. While Field and Schmaeling wouldn’t provide specific numbers, Ryvicker said their “body language suggested the synergies could be larger and recognized sooner” than the company’s current guide. Ryvicker said the “newest and most impressive” information is the company’s investment in data and analytics – specifically Entercom Analytics, a tool that quantifies the impact of a radio campaign for advertisers. “We absolutely think that a bigger platform allows for this type of investment,” Ryvicker wrote. Additionally, Entercom’s scale in sports has “opened the door to CMOs of companies” that Entercom would otherwise not talk to. As the prevailing sounding board for the angst of a zillion sports fans for 30 years, Mike Francesa has always approached his WFAN New York talk show with an atypical sobriety — for sports radio, that is. Five and a half hours of no-frills bloviating on the air in his trademark “New Yawkese,” followed by another five hours of focused game-watching into the small hours of the night. The rest of his days have largely involved planning for future shows and future trips — to the Super Bowl, then spring training — on an endless loop. The NYTimes reports: Not this year. 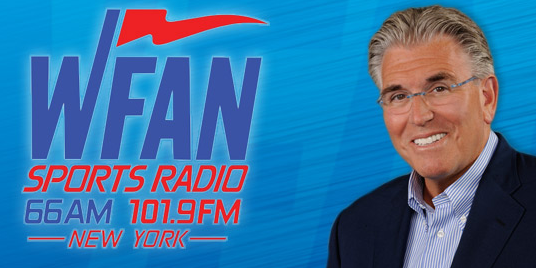 Not after Friday, when Francesa, whose show has been dominating New York’s airwaves practically since its inception in the late 1980s, signs off WFAN for what he insists will be the last time. His departure marks the end of an era for a medium that has endured a radical disruption in recent years. The proliferation of sports podcasts, satellite radio and multiple 24-hour sports networks has congested the soundscape with a stream of shows featuring men yelling at each other about sports. For many years, however, there were seemingly just two: Francesa and Christopher Russo, better known as the Mad Dog, who formed the most influential sports radio duo in the country, until they separated in 2008, with Russo moving to the satellite radio company SiriusXM. Francesa, who is 63 and announced his departure from WFAN last year, still has his followers. His show remains at the top of the ratings among men aged from 25 to 54 in the market, attracting over 1.1 million different listeners per week, according to figures from Nielsen. The numbers have skewed older lately. Millions of other, often younger, sports fans are downloading podcasts from the likes of Bill Simmons or Tony Kornheiser. 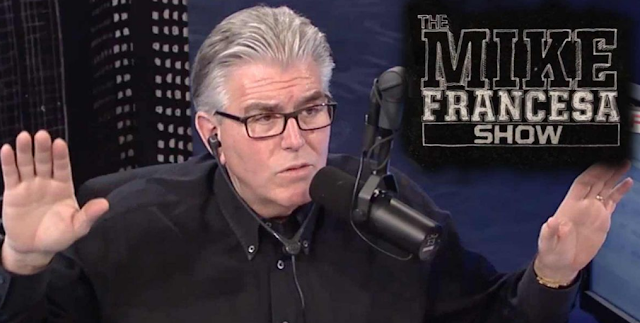 Mike Dee, the president of sports at Entercom Communications, which owns WFAN and more than 200 other stations in 48 markets, said Francesa’s departure was a pivot point. 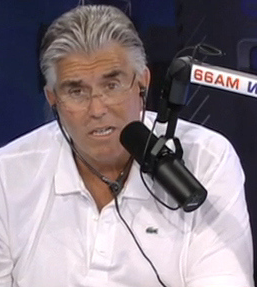 Francesa has famously resisted social media, and he can still devote hours discussing horse racing. Entercom plans to renovate its digital platform, expand deeply with video and emphasize social media. 54-year-old Jamie Dupree has been a radio reporter for Cox Media for more than three decades on Capitol Hill. “The most connected man in Washington,” Sean Hannity likes to call him. But 18 months ago, in the middle of the wildest presidential race of his career, he began to have trouble. During the primaries, his voice got scratchy, by the conventions he was off the air. According to Politico, this past April, doctors finally diagnosed him with tongue protrusion dystonia, a neurological disorder that is so rare there are no doctors who specialize in treating it. Earlier this month, Ros-Lehtinen publicized Dupree’s plight with a touching tribute on the House floor, highlighting the cruelest of ironies: Dupree is a radio reporter without a voice. Dupree may not be a household name in Washington, but to understand the magnitude of what’s befallen him, consider his stature around the country. In the six radio markets served by Cox—Atlanta, Orlando and Dayton among them—Dupree’s name is synonymous with politics. Congressman Doug Collins (R-GA) grew up listening to him on the radio. Another lawmaker—Dupree won’t say who—once asked for his autograph. 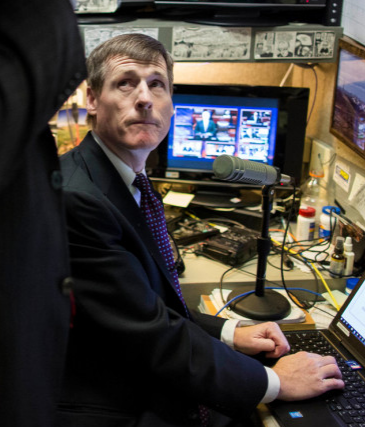 “Jamie is like the dean around here,” said Ted Barrett, a CNN producer, who’s worked alongside Dupree for years. Over the last year and a half—a seemingly never-ending news cycle in which no one from the President down to the lowliest pundit can stop talking—Dupree has been rendered mute. His voice, a smooth baritone that hundreds of thousands of people from Florida to the Plains of Oklahoma depended on for a straight daily dose of national civics, has disappeared. With it went Dupree’s certainty about his career, and his life, too. He could have quit, but he has simply shifted platforms, throwing himself into Facebook and Twitter and a blog he writes that appears on Cox affiliates and newspapers. At home, he has reassured his three kids—aged 8, 11 and 13—that their father is all right, despite an uncertain future. "There is no guarantee I'll get my voice back," Dupree wrote to me. 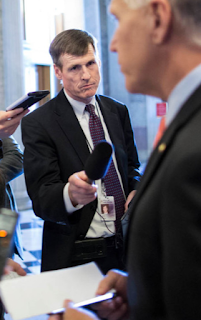 As Dupree’s voice faltered—and with no solution in sight—Cox editors discussed how to adjust their Washington coverage. They wanted Dupree’s name on the radio; he was known and trusted by listeners and surveys found that listeners still responded favorably to him even without his voice on the air. “We figured out he’s still really valuable,” Jon Sonnheim, the Cox Washington Bureau Chief told me. In his stead, Cox TV reporters have done more radio hits and Dupree has stepped up his online presence. He’s a prodigious blogger, answers questions in chats and on Facebook and he regularly tweets Capitol Hill updates to his 145,000 followers.